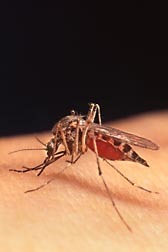 Mosquitoes like this female Aedes (Ochlerotatus) sp., sucking blood to get nourishment for her eggs, can transmit the viruses that cause West Nile fever and Rift Valley fever. All that glitters is not gold, but it is in the case of nanotechnology that’s being used to develop detection tools for viruses that affect animals and people. Scientists at the Agricultural Research Service’s Center for Grain and Animal Health Research (CGAHR) in Manhattan, Kansas, and the University of Wyoming are using surface-enhanced Raman scattering (SERS) with gold nanoparticles to design tests that rapidly identify the virus that causes West Nile fever. The West Nile virus is spread by infected mosquitoes and can cause headaches, fever, and body aches. In some cases, it causes a more serious and sometimes fatal neuroinvasive disease—aseptic meningitis, encephalitis, or acute flaccid paralysis. Symptoms include disorientation, muscle weakness, and paralysis. SERS technology is based on the concept that molecules have their own unique Raman scattering signal—wavelengths that can be detected with a spectroscope. When Raman spectroscopy is used, molecules give off Raman spectra that have sharp peaks, making them more distinguishable than with fluorescence, where molecules emit broad peaks. If a molecule is moved in close proximity to a metal like gold or silver, as with SERS technology, the signal is enhanced maybe up to a millionfold. Using SERS, scientists designed a nucleic acid diagnostic assay that captures Raman dyes—fluorescent tags—and brings them close to the gold nanoparticles in a compound solution. They also developed an immunological assay that rapidly detects antibody responses. In an initial study, researchers used gold nanoparticles and a Raman label of methylene blue dye to detect West Nile virus and develop a nucleic acid assay. “We were having difficulty in getting a really clean signal,” Wilson says. “We could demonstrate signals, but they weren’t of the intensity that we would like.” Eventually, however, the scientists were able to clean up the signals. 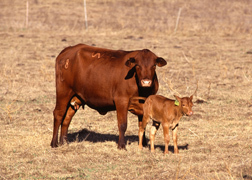 In the future, a pen-side diagnostic test for Rift Valley fever and other diseases of cattle may arise from SERS research. Gold nanoparticles have the ability to enhance light scatter, which can be taken advantage of in detecting virus-infected cells. This is the principle behind SERS that the researchers have used to develop an immunoassay and test its ability in detecting antibodies to West Nile virus. Gold nanoparticles were coated with a West Nile virus protein, and a malachite green-conjugated protein A/G was used as a Raman reporter. Protein A/G binds to immunoglobulin molecules (antibodies). When antibodies specific to viral proteins are present, the protein A/G-antibody complex then binds to the viral protein-coated gold nanoparticles. “Because the protein A/G was labeled with a Raman dye, that would bring the Raman dye in close proximity with the gold nanoparticles and we would get the enhancement from the Raman signal,” Wilson says. The results proved that gold nanoparticles in Raman scattering could be used as a detection tool in an antibody-based system. Still, researchers wanted to increase the signal’s intensity and improve the quality. The second probe is a gold nanoparticle that already has the reporter molecule attached to it, he explains. ARS scientists are using surface-enhanced Raman scattering with gold nanoparticles to design tests for identifying viruses that cause West Nile fever and Rift Valley fever (RVF). 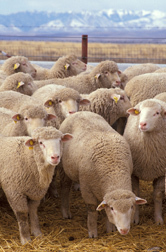 RVF is spread by mosquitoes to humans and to sheep, cattle, and some other livestock in Africa and the Middle East. Gold and magnetic nanoparticles are coated with capture antibodies or DNA in a dry reagent form to avoid having to process blood samples, says Patrick Johnson, assistant professor of chemical and petroleum engineering at the University of Wyoming. If virus proteins are present, they will be detected through SERS spectroscopy, Johnson adds. Scientists are using a bench-top computer system in laboratories to analyze and report the signal. Systems exist that could easily be adapted to field-type instruments, Wilson says. The device would be more like an advanced dipstick that could be used during a disease outbreak to rapidly determine areas where the outbreak is occurring. “It would allow physicians to do quick tests at the bedside of patients, and veterinarians could potentially use it for pen-side tests at farms,” Wilson says. Researchers are using SERS with West Nile virus as well as Rift Valley fever virus, but the process could be adapted to other pathogens, Johnson says. Future studies will involve examining how this technology can be used to identify multiple disease agents in one test. Available pen-side diagnostic tests are generally agent specific. “The sensitivity of this test is much greater than the current pen-side system,” Wilson says. “It’s potentially as good as amplification technology, such as PCR [polymerase chain reaction]. It’s faster and also gives us the potential to easily do multiple-pathogen detection.”—By Sandra Avant, Agricultural Research Service Information Staff. William Wilson is in the USDA-ARS Arthropod-Borne Animal Diseases Research Unit, Center for Grain and Animal Health Research, 1515 College Ave., Manhattan, KS 66502; (785) 537-5570. "A Bit of Gold and Nanotechnology Bring Viruses to Light" was published in the April 2012 issue of Agricultural Research magazine.